Before Adrian started kindergarten, his goal was to learn to read. And I have to admit, after teaching three kids to read, the idea of outsourcing that job for fourth kid was pretty nice. 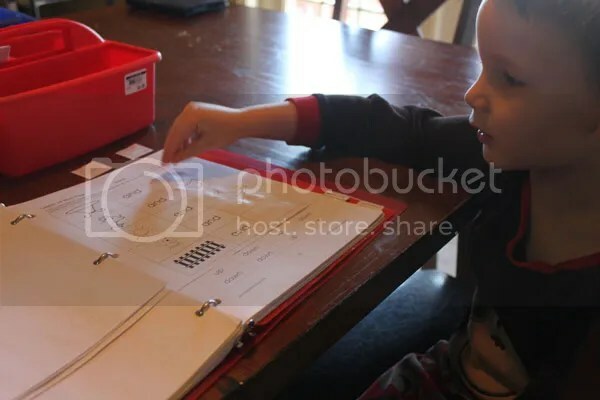 After 5 months in school, however, he had only learned a handful of sight words he didn’t already know. So of course, at home, his goal is still to learn to read. 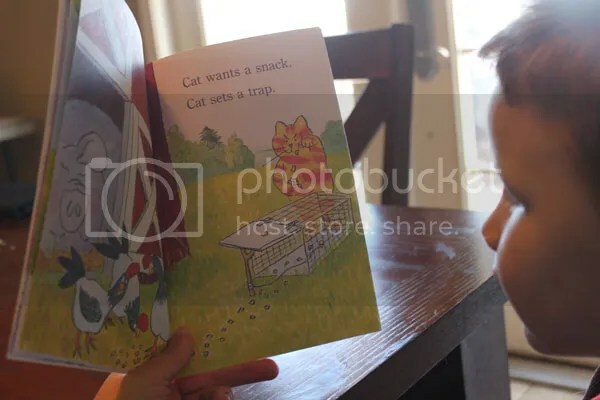 And he is making incredible progress with a combination of Reading Eggs and Primary Arts of Language: Reading from Institute for Excellence in Writing. PAL is kind of unique in that it teaches letter combinations right from the start instead of just the letters and their sounds. The very first lesson Adrian was taught what ee, the squealy e’s says. That’s the other fabulous things about PAL. There are stories about the letters. See, ee are such good friends, that when they are together they squeal eeeeee! a is angry because she has a ponytail and the boys keep pulling it and making her say /a/ (short a sound). 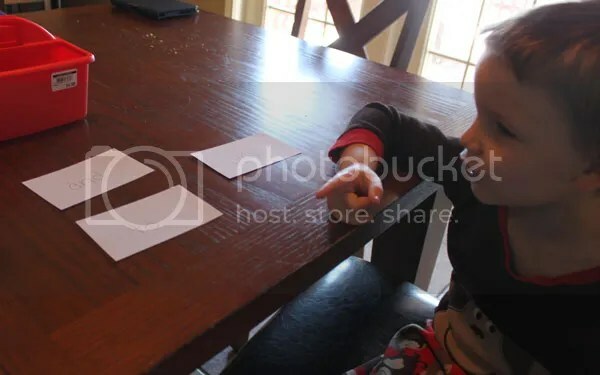 k is the kicking letter (and the letter stories file folder game piece has feet) so it says /k/ like in kick. Stuff like that. Adrian loves those letter stories (even though he already knew the letters and their sounds before we started). So far we are through 15 lessons and today Adrian was presented with the word down. The ow had been underlined to call his attention to them going together. He knew that when ow get pinched between other letters they say “ow!” He put that together with the sounds d and n make and he was able to decode the word very quickly. Each lesson starts with a poem. This week we’ve been reading and discussing The Squirrel. Yesterday I had him close his eyes to visualize what was happening while I read it to him. Then we do his writing lesson. Writing was a huge deal while he was in public school. 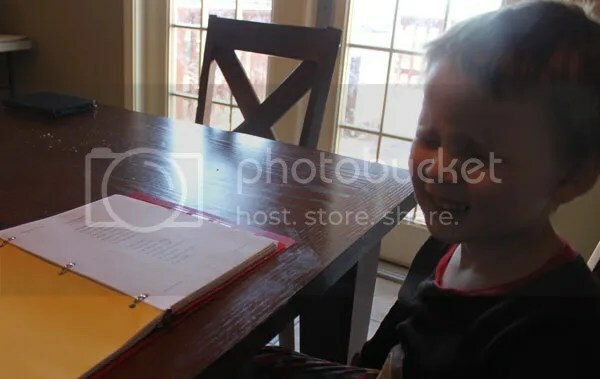 He hates writing and it is hard for him (just as it has been for all of my kids at 5… because they are, you know, 5). He was most likely to act up in class when they were supposed to be sitting at their desks writing. So we opted not to get Primary Arts of Language: Writing (which is done concurrently with the reading program, but doesn’t have to be). Instead we do a writing lesson of my own creation and the amazing thing is, he doesn’t really resist! We start with a journal entry. Today’s windy with Mr. Wind. That’s it for today. We’re doing the same today as last morning. There is something I want to talk to you about today. Well, I don’t need a seatbelt, but’s it’s a rule everyone needs seatbelts. Well, that’s the end. When I step in the sun it burns my feet. We’re doing the same today. When I put my hand in the sun it burns my hand. The sun is hot. When there is a little bit of sun and a little bit of shade it is good and does not burn me. I wonder why? The end! 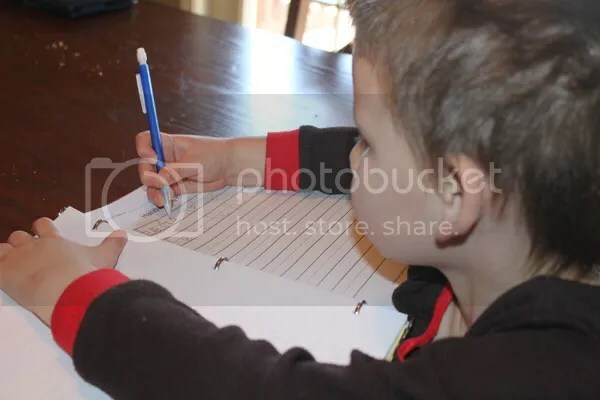 After that, he does a handwriting worksheet. I have him trace dotted lines to make the words he learned the previous lesson. We’re still working on getting the pencil grip right (they tried the positioner thingy at school and he chewed it up). 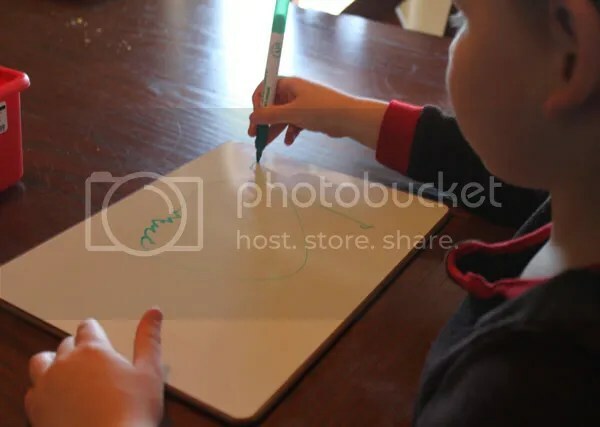 When we were going through the letters of the alphabet (2-3 a day for the first several lessons), I had him make the letters using Wiki Stix on letter cards and also use the Magic Board with letter overlays to write the letters. Now that he has completed writing the letters, he has free access to these to play with them whenever he wants. The next thing we do (2 or 3 times a week) is I read a story to him. Twice. Sometimes three times. He loves repetition. Then he tells me what happened in the story. 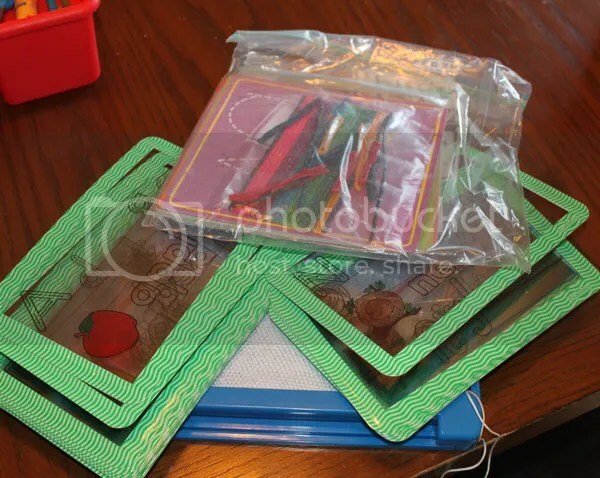 Next he does a few file folder games (at this point… it changes as they learn to read better). So far he’s gotten 14 of the 35 games. He loves these games! 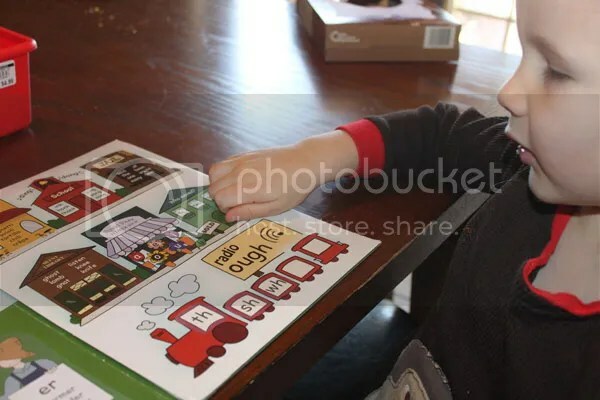 They range from putting letters in alphabetical order to sorting based on the vowel sound in the word to determining the initial consonant sounds in words. After that, he gets his new word cards. Some of these are sight words. Some are words for him to decode and then learn them to be able to read instantly. Some are teaching a letter combination (like the “magic” silent e). Each day we go through a few of the words in his stack. Some days we play lightning where he tells me what word is on the card as fast as he can (or, alternatively, slow lightning – a game he invented where he reads the word as fast as he can, but says it super slowly drawing out the sounds in it). Some days he “feeds” his cards to his Feed Me Monster as he reads them. According to PAL, it takes about 55 times for a word to get cemented in a kid’s brain so going through these words each day helps with that. Then we visit the phonetic farm. Most days we have a sticker or two to add to it. Some days we just review some of the stickers we’ve already put on. The phonetic farm is truly awesome. It’s a visual way to see all the sounds letters and letter combinations make in different places in words. Every sticker has a picture and/or story to go with it to help him remember what the letters say. Each day he has a work page to do. 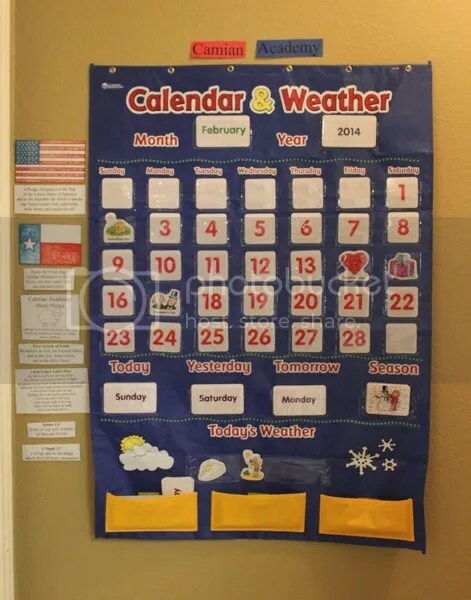 These involve reading words or phrases over and over and putting them in the correct place. Adrian has a very hard time cutting so I do that part for him. He likes doing the gluing. Most days he has a reading practice page added to his binder. Days when there is no new reading practice page, he reads a previous page. In addition to the full page we pick a few sentences at random from the other pages to read as well. 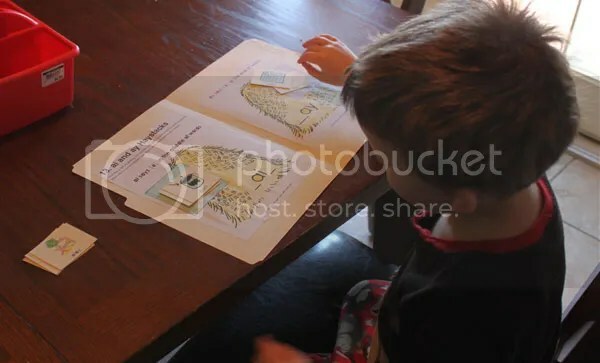 Depending on how long the lesson has been (lessons run 30-60 minutes of concentrated work) and how tired he is getting, I’ll read and have him repeat or I’ll ask him to find certain words or only have him read a couple sentences on his own. After that, we visit the phonetic farm again. We review every stick and location he has learned so far and take a ride on the train. Finally, he has an informal spelling test. At this point we’re just doing letters and letter combinations. He uses the white board and write on/wipe off markers. Sometimes his letters get very creative and he tells stories about why a letter’s face looks like it does or why its hair looks like it does. Several lessons ago he learned that A, E, I, O, and U are the vowels. We were instructed to put up a vowel ladder in a doorway that he uses regularly. We don’t really have any of those so we put the letters on the post between our living and dining rooms. The idea is that as he passes he’s supposed to hit each letter and say their names and/or sounds. He goes over to it several times a day still, a couple weeks later, to do that (bonus: Fritz apparently didn’t know which letters were the vowels and has learned them as well thanks to the vowel ladder). I truly couldn’t be more thrilled with Primary Arts of Language: Reading. Adrian’s loving it and it’s really helping him easily learn to read. When I was homeschooled, the options were basically Alpha Omega and A Beka. I know there were others out there (ACE, Calvert, BJU, etc. ), but those are the two that my parents could find. The internet didn’t exist like it does now. Homeschooling was a lot harder then. When I started homeschooling Ani and Cameron, there were a whole lot more options. Choosing what to use got both easier (to find what was out there) and harder (more to choose from). On-line support groups popped up. The choices increased even more over the few years between then and Fritz starting to be homeschooled. Now, it is incredible how many options for curricula there are. Parents have shared ideas, provided free resources and links, and even entire, free options like Easy Peasy have come along. Homeschooling today is easier than it’s ever been. It is truly amazing how much can change in just a couple decades! For a couple weeks now we have done a full school schedule. Some days are taking a little longer than they should, but we’re finding our homeschooling groove again. We start out our day with Circle Time. Then we do a day of a Download N Go unit study. Then we practice our current skills for taekwondo. And then we do Song School Latin. All of those things are done all together. 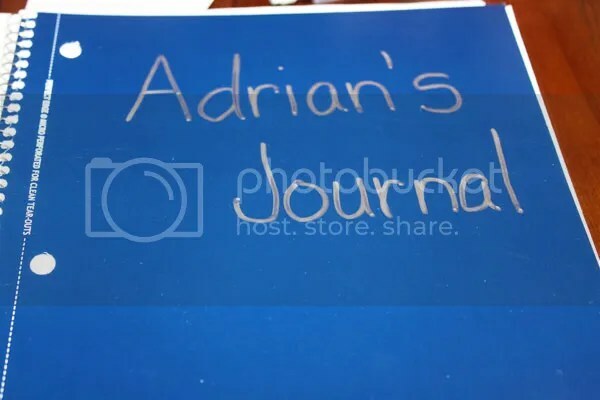 Adrian then does Book of Mormon scripture stories scripture notebooking. He watched the videos on the Mormon Channel on the Roku three to six times each before narrating what it was about to me (he wants to watch them multiple times). Then he reads in a McGuffey Reader and does Easy Peasy assignments. Then he and I do a PAL: Reading lesson. And then he plays on Reading Eggs and MathSeeds for about an hour or so (combined). Fritz does Discover the Scriptures Book of Mormon and scripture stories scripture notebooking. Because he does Discover the Scriptures as well, he is far behind Adrian for the notebooking part. Then he does his Easy Peasy assignments. Then he plays on Reading Eggspress for 20-30 minutes. That gives me a chance to finish up with Adrian. Then Fritz does math (Singapore), Shurley English, and Spelling Power. 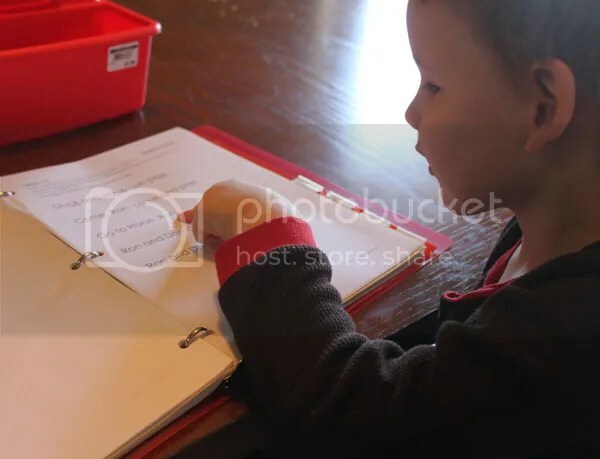 He does a page in his D’Nealian Handwriting workbook and takes a timed math drill. I read a chapter in Life of Fred math and Life of Fred language arts to him. He reads a chapter of a Magic Tree House book out loud to me. 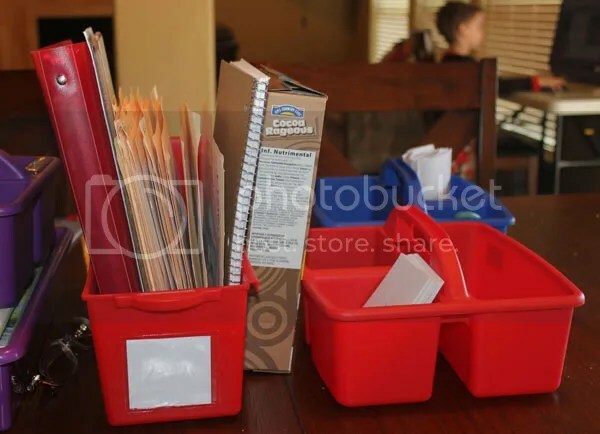 He chooses a file folder game and plays it. We watch a Crash Course video together (currently biology). On Fridays, we skip Latin and everything after Spelling Power. So far we’re loving homeschooling again! It’s nice to be getting back in the groove. Since the little guys attended public school for a semester, they are very used to starting the day with announcements and circle time. They wanted to keep doing that so when we start school (at about 8:30 – 50 minutes later than the elementary school starts) we go to the hall outside what will be my parents’ bedroom and do our circle time. We start with the calendar. This has been a sneaky way to help Fritz learn the days of the week (Adrian somehow already knows them). Then we do the weather. The card that shows it is winter makes the boys laugh because most days we’re in the 70s and 80s. No snow for us. Then we do the Pledge of Allegiance, the Texas Pledge, and the Camian Academy Sheep Pledge. Their school had a pledge and so Fritz requested we have one as well for our homeschool. He helped make it up (I pledge to do better and better every day. I love my mommy, my daddy, my sister, and my brothers.) Then we recite the first article of faith (once they’ve got that one memorized, we’ll continue through the rest). Then we sing the current song they’re learning in primary (I Will Follow God’s Plan is this month’s). Then we recite the scripture memory verses Fritz is working on in Discover the Book of Mormon. And then we say a prayer. I named our school Camian Academy when we first started out homeschooling. It’s from CAMeron’s name and then I rearranged the letters in Ani’s name to make the first word sound nice. Of course Ani and Cameron are no longer homeschooled. There is ian in AdrIAN, but that leaves Fritz out completely. Neither of the little boys were born when I made up our school name. Colors and mascot are things the big kids never asked for since they were never in public school before being homeschooled. The boys picked blue and red to be our school colors. Blue is Fritz’s favorite color and red is Adrian’s. Fritz really wanted a mascot so I let him pick. He chose a sheep. I’m glad I didn’t let Adrian pick. If I had, we’d be the chickens. 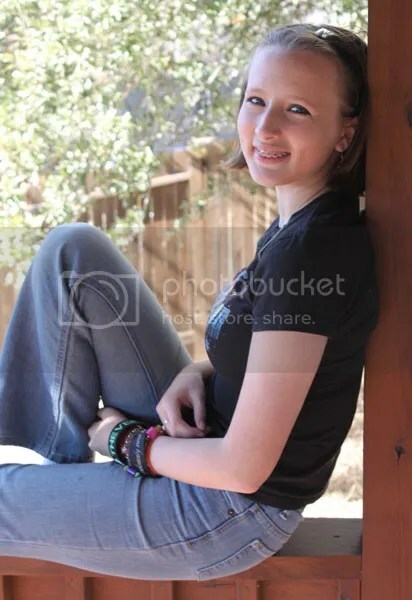 Somehow in the last 14 years my first baby grew from a tiny 6 pounds 11 ounces to this beautiful young woman! Last week we did the Download N Go Twisting Tornadoes. I’m not sure it was the best idea considering how anxious Fritz gets (particularly about weather). But he picked it and we did it. 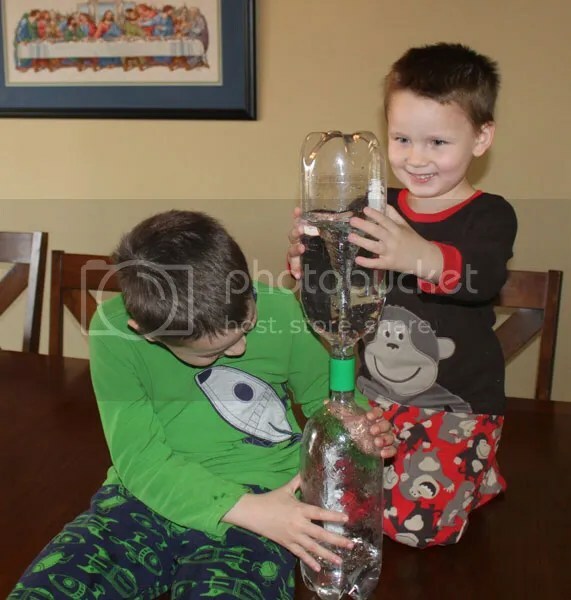 The boys’ favorite part was the tornado in a bottle we made. They played with it all week. In the public schools in our district, the kids do some lapbooking. They don’t do it in file folders, but in more of an interactive notebook form (which I’ve always preferred actually). When we pulled the little guys out, they both had several several books of various lapbooking bits. Cameron has a composition book full of lapbook pieces in his English class and he’s done lapbooking in other classes, too (they usually call them “foldables”). Even Ani, in high school, lapbooks. 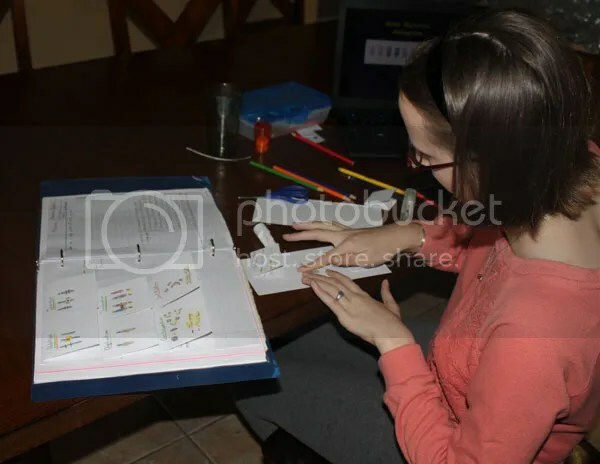 This picture is her doing some biology homework a few weeks ago. Lapbooking is generally so thought of as a homeschooling thing. The first time we did a review with the county in Maryland, the reviewer (who had been a teacher and then a principal in the district for 40+ years) was so fascinated by our lapbooks. He had never heard of them but thought they were really neat. This is just another thing that makes our public schools unusual and truly fabulous!